The monitoring of soft tissue changes is an essential factor to assess short and long term results of prosthetic, periodontal and implant therapy [1, 2]. The most recent classifications of periodontal diseases published by the consequence of Consensus Conference about periodontal disease and case definitions [3, 4] were based on measurements of attachment level, probing depth, bone loss and/or degree of inflammation. Health (or “no disease”) was defined as concurrent absence of these signs and symptoms and was always related to such measurement and mm values. Periodontal health is a clinical condition related to the absence of progressive attachment loss around the tooth. Several recent findings suggest that the lack of consensus in the definitions of periodontal disease may be connected with the difficulties on having conformity about diagnosis by the clinicians. However, the combination of X-ray investigation and individual clinical outcome parameters, such as periodontal deep (PD), bleeding on probing (BOP), and others, provide the basis to assess classification systems for oral health and periodontitis, and they provide the basis to improve diagnosis accuracy [1-6]. The periodontal probe is mostly used in common clinical practice to perform this type of measurements like keratinized tissue amount, papilla height, and gingival recessions with a mean error of 1 mm [3-6]. This imprecision can generate an incorrect interpretation by the clinician, which can potentially result in an alteration of the data reported in several studies comparing different therapeutic treatments or techniques. In the recent literature, several digital techniques have been proposed to avoid this problem and to improve the precision of the evaluation methods. Some protocols use measurements on virtual models obtained by optical scans taken intraorally [7-10]. Others instead, exploit radiodense marker  or prosthetic landmarks to perform measurements using digital technology, respectively, with cone beam CT or intra-oral photographs [11-13]. The common feature to these approaches is the possibility to perform repeatable and comparable measurements with accuracy greater than periodontal probes . It would seem that digital measurements improve the reliability and most of all the reproducibility of the measurements. The aim of the present study was to assess inter and intra-operative concordance of a measurement method aimed at evaluating the apico-coronal migration of the free gingival margin, using intra-oral photography combined with a digital software dedicated for scientific measurements. Fig. (1a). Intra operator concordance correlation Reader (D.F.). The present investigation was performed accordingly with the declaration of Helsinki rules. The method was tested on peri-implant tissues that received a connective tissue graft on the second stage surgery. Peri-implant tissues were assessed up to four follow-up appointments (30, 60, 90, 120 days after the provisionalization of the implants). Thirty-eight measurements on 13 implants (Global, Sweden & Martina, Padua, Italy®) in 8 patients were recorded Figs. (1a, 2a). In every follow-up appointment, an intra-oral photograph was taken for the graft and the provisional cemented crown, which enclosed a circular landmark, centered in the middle of the tooth, with a previously determined diameter. The landmark was prepared with a red-resin by the same technician Fig. (3). 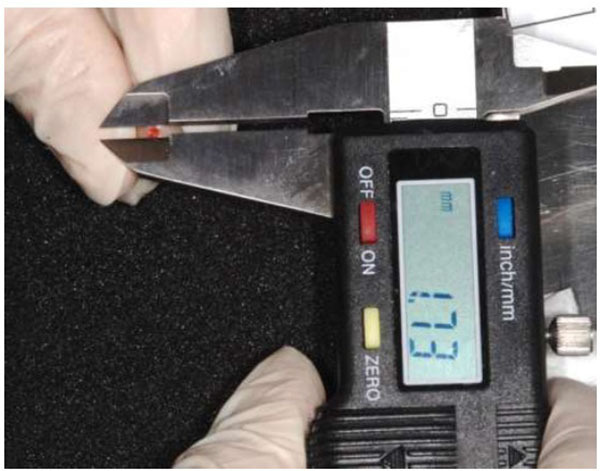 Before crown cementation, the landmark was calibrated with a digital hi-precision caliper (Thomas Scientific Swedesboro, USA) by the main investigator, to determine the precise diameter up to two decimal numbers Fig. (4). Fig. (1b). Intra operator concordance correlation Reader (F.L.). Fig. (1c). Intra operator concordance correlation Reader (F.A.). Considering the second examiner (F.L), the Bland-Altman analysis indicates that the 95% limits of agreement between the mean of the two readings made in different times ranged from -0.76 to 0.43 mm. The medium difference was 0.16 mm. Fig. (2a). The inter-operator concordance between D.F. and L.I. Considering the third examiner, the Bland-Altman analysis indicates that the 95% limits of agreement between the two readings ranged from -0.35 to 0.27 mm. The medium difference was -0.037 mm. Fig. (2b). The inter-operator concordance between L.F. and F.A. Fig. (2c). The inter-operator concordance between D.F. and F.A. Considering the inter-operators concordance, the Bland-Altman analysis indicates that the 95% limits of agreement between the mean two readings ranged from -0.35 to 0.28 mm. The medium difference was 0.048 mm. On the intra-oral photograph, the distance was measured from the most apical point of the determined landmark to the zenith of the gingiva, using an image processing program designed for scientific multi-dimensional images (IMAGEJ 1.43u, NIH, Bethesda, MD, USA) Figs. (5, 6). The same clinician, who took also the intra-oral photographs, performed surgical and prosthetic procedures. Three independent examiners who repeated the same measurements after one month in order to test inter and intra-operator concordance took the measurements with the software. The examiners were blinded about the patients’ identification and the time of the follow-up. Fig. (3). Circular landmark, centred in the middle of the tooth, with a previously determined diameter, on a provisional crown. Image J is an open-source software ideal for scientific measurements because it can be freely inspected, modified, and redistributed. Standardized clinical intra-oral photographs were taken with a digital Single Lens Reflex camera (Nikon D90, Nikon Corp, Shinjuku, Japan) at the moment of interim crown cementation (baseline) and 1 to 4 follow-up visits to evaluate the soft tissue changes Fig. (2a). Every picture was acquired at 90° to the axis of the tooth using dedicated intraoral mirrors (PhotoMed International Van Nuys, Canada). At each evaluation, the prosthetic landmark has been calibrated with the software in order to transform the pixel of the photograph in millimeters. The calibration of the landmark has permitted to delete the error caused by the inclination of the (+/- 90°) of the intraoral photography. In fact, landmark calibration at each evaluation session avoided the distortions caused by the not perpendicular position of the camera respect to the long axis of the tooth. Fig. (4). On-site evaluation of the landmark with a digital caliper. The measurements were entered into an Excel spreadsheet (Microsoft, Redmond, WA, USA) for the statistical analysis. Data were analyzed by the means of SAS 9.4 (SAS Institute, Inc., Cary, NC, USA) for Windows 10. To evaluate the reproducibility of the method inter and intra-rater concordance was evaluated with Bland and Altman plots and Lin’s concordance correlation coefficients12, and 95% confidence interval (95% CI) calculated with the bootstrap method using 2000 resampling. In estimating inter-rater agreement, the mean of the two readings made in different times was considered. Results showed that the intra-rater,(CCC) was higher than 0.9 for each of the three examiners. Inter-rater agreement was also high (CCC = 0.964, 95% CI: 0.949 - 0.980) (Table 1). Figs. (1a, 1b, 1c) and Figs. 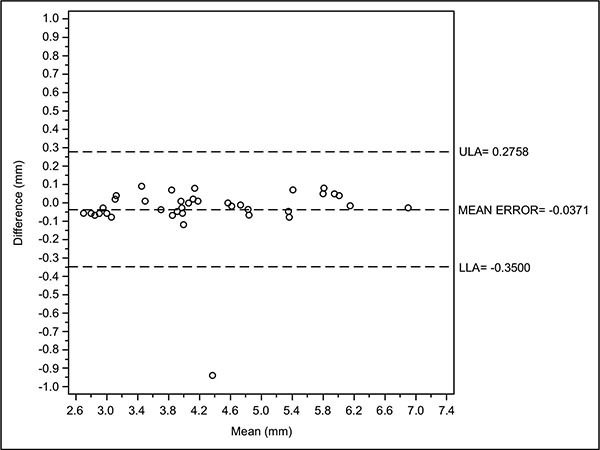 (2a, 2b, 2c) with the Bland-Altman plots illustrates the intra- and inter-rater agreement expressed as mean error and the lower (LLA) and upper (ULA) 95% limits of agreement. Considering the first examiner (D.F) the Bland-Altman analysis indicates that the 95% limits of agreement between the two readings ranged from -0.156 to 0.188 mm. The medium difference was 0.0158 mm. Fig. (5). Calibration method of the centered landmark. Fig. (6). Distance measurement from the inferior border of the landmark to the free gingival margin. Considering the inter-operators concordance the Bland-Altman analysis indicates that the 95% limits of agreement between the two mean readings ranged from -0.47 to 0.81 mm. The medium difference was 0.172 mm. This study was conducted to evaluate the reproducibility of the previously described method for soft tissues changes monitoring, both between different and among the same operators. The rationale of the present research is related to a current debated topic; to find a predictable method in order to standardize and quantify the periodontal tissue consistency without measurements errors. For this reason the present study aim is to investigate by digital evaluation the consistence and the health of surrounding dental implant gingiva [1, 7, 15, 16]. 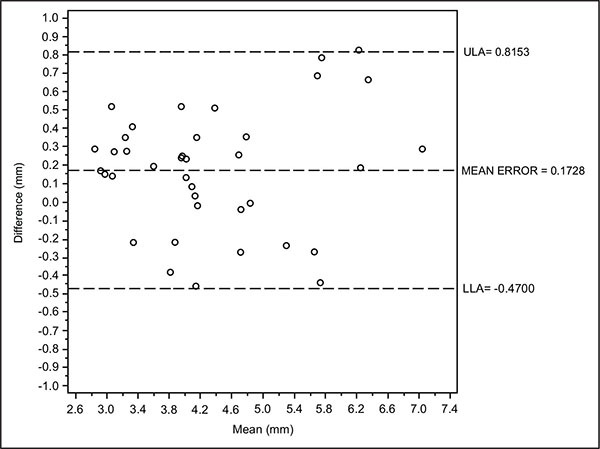 The results of the investigation have shown a higher accuracy of digital measurements of intraoral measurements [5, 8] comparing the obtained data to those presented in literature. 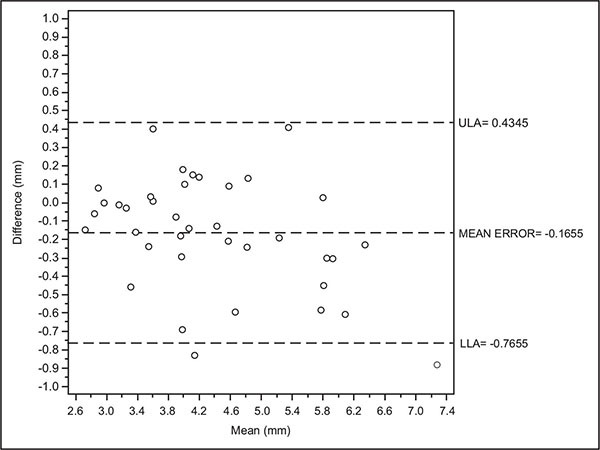 In fact, intra-operators mean errors between first and second reading were respectively 0.015, - 0.165, - 0.037 mm. Although direct intraoral measurements have the advantage of low infrastructural requirements, they are limited by several factors. First, limited visual access to the reference points may be present. Reading errors based on different visual angles and projections of the scale of the instrument are also possible. Moreover, values are usually rounded to the next millimeter [7, 17]. Table 1. The data recorded from the three different examiners. The method investigated in this work consistently provide similar measures with a level of disagreement that doesn’t includes clinically important discrepancies and these findings are in line with those present in literature for digitized cast models and digital models from intraoral scanning showing inter and intra concordance of 0.99 [8, 18, 19]. Several digital methods have been recently used in medicine for diagnosis, planning, therapy, intra operative and postoperative complications management. The advantage of using digital method is related to the reducing clinical and postoperative patients’ discomfort. Moreover, a computer aided planning of a treatment seems to be useful in order to prevent all the clinical intraoperative complications [20-22]. Therefore, in this investigation, the advantage of using photographs, instead of direct clinical measurements, is a wider vision field, and it can be performed in a non-clinical environment without time pressure; they can be repeated several times if necessary and with the use of various tools possibly not suitable for intraoral applications. Moreover, the innovative advantage of the present non-invasive approach is that the spatial plane of the prosthetic landmarks is the same of the tooth unlike the utilization of periodontal probe, which is generally positioned on different plans in the space (generally more vestibular). As a matter of principle, this could provoke a variable enlargement of the probe in the picture with the consequent problem of the digital software calibration. The integration of the red dot inside the interim crown has permitted to avoid errors caused by the projection and prospective. It’s therefore author’s opinion that a pre-determined diameter landmark overcomes the distortion resulting from different photograph angulations, both apico-coronal and mesio-distal, at the time of the software’s ruler calibration. Consequently, every measurement session has maintained the same calibration parameters not it was not influenced from deviations caused by free hand photograph frames. A comparable method to obtain the same requisites (the same spatial plane at every evaluation session) would be the use of periodontal probe with a resin stent. However, this method could be of a higher cost and its applicability in the posterior area can be even more difficult. Regarding the disadvantages, this technique might pose a difficulty in molars, as taking photos in this area is more challenging. Ricci already proposed the measurement of soft tissue changes taking standardized photographs of study models that are positioned reproducibly with bite registration material . Dental casts made in the course of therapy were mounted for photography one after each other on the same day, using the same registration compound. A grid was laid over the images, they were superimposed and reference lines were used to take measurements after importation into graphical software. The technique compared the outcome of a certain procedure with a linear error <0.1 mm. The method presented in the following study could be comparable to the procedure described by Ricci in terms of results and objectives. It is inferable that similar outcomes have been found using the software associated with intraoral photographs combined with a pre-determined landmark for software calibration. From the other hand, possible errors of the technique may be avoided with the elimination of cast models and with the bite registrations. From the results of this work emerges that both inter and intra reading agreement of the method is high for its scientific and clinical applications; furthermore, the high level of inter operator concordance allows to compare data recorded by different clinicians in soft tissue monitoring; the range of discrepancies, higher for the inter-operator analysis, are probably caused by the different interpretation by the readers of the initial and end point of the measurement. In fact the end point represented by the zenith of the gingiva could be different interpreted most of all for photographs of the posterior area which are, inevitably, not perpendicular. A limit of this study is that it is not possible to confirm the absolute values amount of the measurements recorded because an alternative control method was not taken into account. Other studies will be necessary to verify the reliability of distance measurements taken digitally on photographs using a known landmark on the tooth. We can speculate that the present method can be extended also to natural teeth without provisional crowns using a known landmark, which could be positioned on the same plan of the tooth (for example a composite resin dot). The results obtained from the present analysis underlines that this method of calibration of well-known landmark with the software allows to obtain reproducible measurements in the comparison of gingival margin migration over the time. It’s therefore author’s opinion that it is valid, rapid and economic method for the monitoring of the soft tissue modifications for clinical and research applications. Further studies will be necessary for the evaluation of the reliability of the distance measurements. This would enhance the comparability regarding the same technique performed in the different clinical trials. Fürhauser R, Florescu D, Benesch T, Haas R, Mailath G, Watzek G. Evaluation of soft tissue around single-tooth implant crowns: The pink esthetic score. Clin Oral Implants Res 2005; 16(6): 639-44. Boardman N, Darby I, Chen S. A retrospective evaluation of aesthetic outcomes for single-tooth implants in the anterior maxilla. Clin Oral Implants Res 2016; 27(4): 443-51. Abbas F, Hart AA, Oosting J, van der Velden U. Effect of training and probing force on the reproducibility of pocket depth measurements. J Periodontal Res 1982; 17(2): 226-34. Tonetti MS, Claffey N. Advances in the progression of periodontitis and proposal of definitions of a periodontitis case and disease progression for use in risk factor research: Group C consensus report of the 5th European Workshop in Periodontology. J Clin Periodontol 2005; 32(Suppl. 6): 210-3. 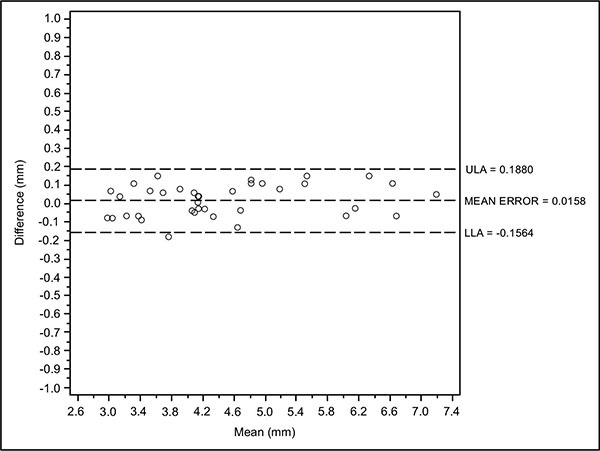 Badersten A, Nilvéus R, Egelberg J. Reproducibility of probing attachment level measurements. J Clin Periodontol 1984; 11(7): 475-85. Cekici A, Kantarci A, Hasturk H, Van Dyke TE. Inflammatory and immune pathways in the pathogenesis of periodontal disease. Periodontol 2000 2014; 64(1): 57-80. Claffey N, Nylund K, Kiger R, Garrett S, Egelberg J. Diagnostic predictability of scores of plaque, bleeding, suppuration and probing depth for probing attachment loss. 3 1/2 years of observation following initial periodontal therapy. J Clin Periodontol 1990; 17(2): 108-14. Wang SF, Leknes KN, Zimmerman GJ, Sigurdsson TJ, Wikesjö UM, Selvig KA. Intra and inter-examiner reproducibility in constant force probing. J Clin Periodontol 1995; 22(12): 918-22. Osborn J, Stoltenberg J, Huso B, Aeppli D, Pihlstrom B. 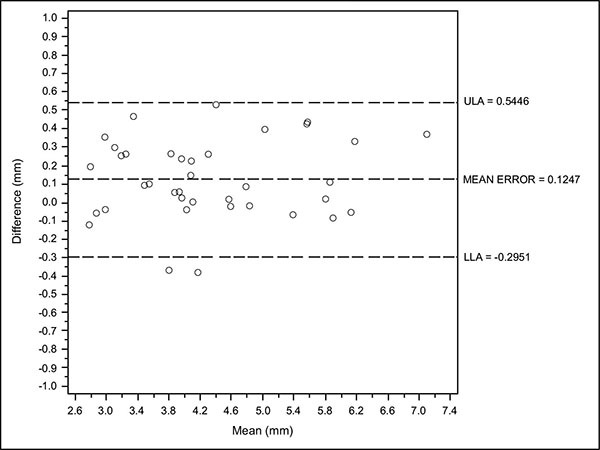 Comparison of measurement variability using a standard and constant force periodontal probe. J Periodontol 1990; 61(8): 497-503. Speroni S, Cicciù M, Maridati P, Grossi GB, Maiorana C. Clinical investigation of mucosal thickness stability after soft tissue grafting around implants: A 3-year retrospective study. Indian J Dent Res 2010; 21(4): 474-9. Kniha K, Gahlert M, Hicklin S, Brägger U, Kniha H, Milz S. Evaluation of hard and soft tissue dimensions around Zirconium Oxide implant-supported crowns: A 1-year retrospective study. J Periodontol 2016; 87(5): 511-8. Rodrigues GG, Madureira DF, Lages EM, Lages EJ, Pretti H. Gingival volume measurement through the analysis of tooth crown area: a digital and computed method. Int J Periodontics Restorative Dent 2012; 32(5): 591-6. Schneider D, Ender A, Truninger T, et al. 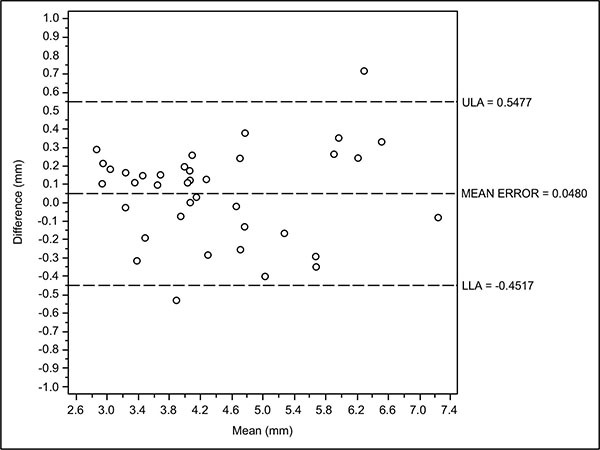 Comparison between clinical and digital soft tissue measurements. J Esthet Restor Dent 2014; 26(3): 191-9. Bland JM, Altman DG. Measuring agreement in method comparison studies. Stat Methods Med Res 1999; 8(2): 135-60.
 van der Velden U. Probing force and the relationship of the probe tip to the periodontal tissues. J Clin Periodontol 1979; 6(2): 106-14. Watts T. Constant force probing with and without a stent in untreated periodontal disease: The clinical reproducibility problem and possible sources of error. J Clin Periodontol 1987; 14(7): 407-11. Wiranto MG, Engelbrecht WP, Tutein Nolthenius HE, van der Meer WJ, Ren Y. Validity, reliability, and reproducibility of linear measurements on digital models obtained from intraoral and cone-beam computed tomography scans of alginate impressions. Am J Orthod Dentofacial Orthop 2013; 143(1): 140-7. Cicciù M, Beretta M, Risitano G, Maiorana C. Cemented-retained vs screw-retained implant restorations: An investigation on 1939 dental implants. Minerva Stomatol 2008; 57(4): 167-79. Cicciù M, Risitano G, Maiorana C, Franceschini G. Parametric analysis of the strength in the Toronto osseous-prosthesis system. Minerva Stomatol 2009; 58(1-2): 9-23. Lauritano F, Runci M, Cervino G, Fiorillo L, Bramanti E, Cicciù M. Three-dimensional evaluation of different prosthesis retention systems using finite element analysis and the Von Mises stress test. Minerva Stomatol 2016; 65(6): 353-67. Ricci A. An objective method to measure soft tissue behavior around single-tooth implants. Part 1: Vertical measurements. Eur J Esthet Dent 2007; 2(4): 406-18.